Lille Diane poses with her artwork at The Painted Turtle Studio in Mancos. Lille Diane’s artwork is much more than creative expression. It serves as medicine for her body, mind and soul. And she finds creative journaling is her strongest medicine. As a multimedia artist, Diane enjoys painting with acrylics and watercolor, working with leather and metal and sculpting with clay. “One medium opens up a door to discover another, that opens up a door to another rabbit trail,” she said. Diane’s watercolors begin with an ink sketch. “I love sitting in restaurants and sketching while my food’s being made.” Usually she goes unnoticed, but Diane said sometimes customers will walk over and see what she’s drawing. For creative journaling Diane said,”I like to take things, basically trash, and give it a forever life.” She paints a piece then layers it with fabric, paper towels, flower petals, old greeting cards and recycled theater tickets to create other art. 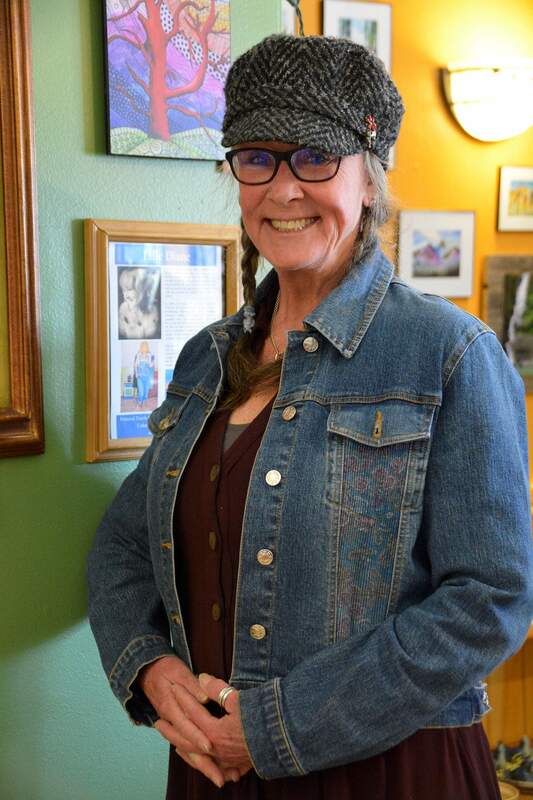 Diane, a Mancos resident, shares her talent teaching art classes at The Painted Turtle Studio and Gallery at 200 W. Grand Ave., where she also showcases and sells some of her pieces. She is also gallery manager, class coordinator and works as a volunteer. “A lot of people think that the studio is just for children or all about clay, but it is technically very diverse. We offer a variety of classes in fiber art, knitting, photography, paint-along classes, clay of all kinds and glass fusing. Multimedia art classes from adult and children.” This summer, they plan to offer music classes. She offers two classes at SkillShare.com. One, HandScape, involves tracing your hand on paper and adding watercolor and doodles. The other class is Boho-style window bling using Sari ribbon to make no-sew window covers. In high school, Diane took both music and art. In her early 20s, she started making jewelry and sewing clothes. She thought her career path was leading her toward fashion design but instead she chose music. For almost 25 years, Diane traveled nationally, singing and playing guitar and ukulele performing jazz, blues and country songs. At 65, Diane does not consider herself retired. “This is probably the most fun I’m having in my life, this aspect of giving back. 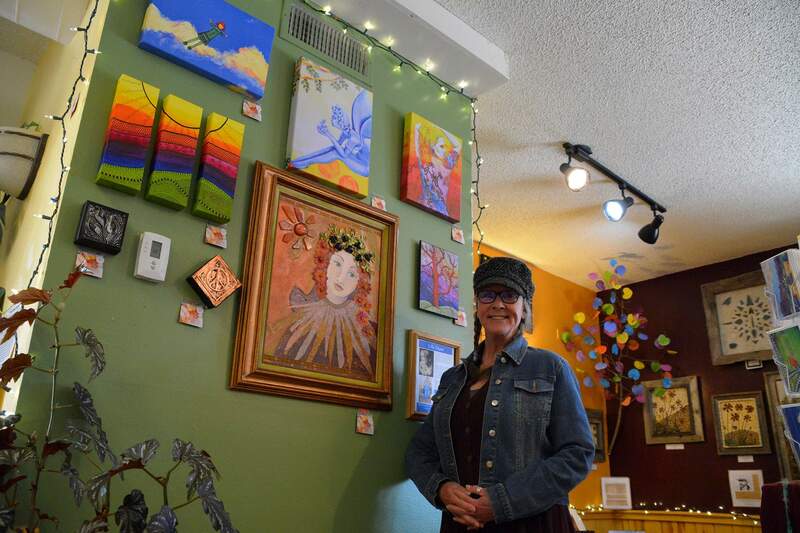 And having the time to do it.” She also serves as a board member of the Mancos Creative District. Her free time is spent with her husband Don, their four children, eight grandchildren dog Toby, a rescued Labradane mix. For more information, about Diane visit her website at www.yoursoulpicnic.com. For information about classes at The Painted Turtle Studio, visit www.paintedturtlestudio.org. Visit them on Facebook at Painted Turtle Studio and Gallery or call at 970-533-7136. Hours are Tuesday-Sunday from 10 a.m. to 3 p.m.
For more information about classes at The Painted Turtle Studio and Gallery, visit www.paintedturtlestudio.org. Visit the artists on Facebook at Painted Turtle Studio and Gallery or call 533-7136. Hours are 10 a.m. to 3 p.m. Tuesday through Sunday.